Cauliflower is the low-carb enthusiast's best friend. This recipe has all the savory, delicious flavors of regular hash browns for a fraction of the carbs. The vitamins and minerals in the spinach will help your body build muscle while staying lean. Grate the cauliflower using a food processor or a cheese grater. Combine with shallot, 1 egg, and salt. Let sit 5 minutes. In a hot skillet, heat a little bit of olive oil and spread the cauliflower mixture in a thin layer. Sear cauliflower on medium-high heat for 4-5 minutes, until it starts to brown. Then, carefully flip and sear the other side. While cauliflower is cooking, bring a pot of water to a gentle boil with a tablespoon of white vinegar. Carefully crack eggs into the water and cook for 2 minutes at a gentle simmer. Wilt the spinach in a pan with a splash of water and a squeeze of lemon. Season to taste with salt. 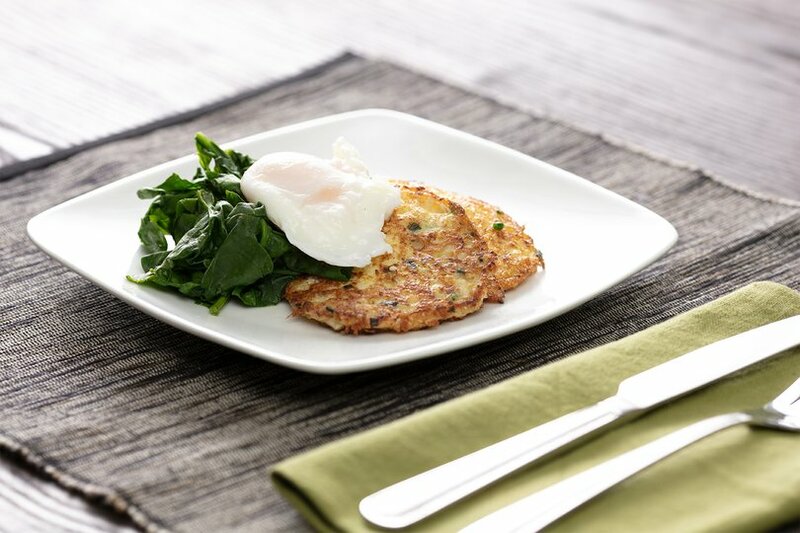 Plate the hash browns with wilted spinach, and poached eggs.